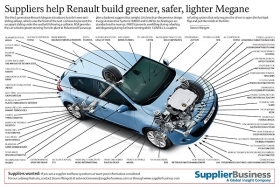 The third-generation Renault Megane introduces Autoliv’s new anti-sliding airbags, which raise the front of the seat cushions to prevent the occupant sliding under the seatbelt following a collision. NSK provides the car’s electric power steering from its plant in Poland and Ficosa supplies a backrest support that weighs 10% less than the previous design. Inergy Automotive Systems’ INROV and CLINFILL technologies are standard on the new car. INROV prevents overfilling during refueling and degassing during fuel tank venting while CLINFILL is a capless refueling system that only requires the driver to open the fuel tank flap and put the nozzle in the filler.